I’ve also loved the way he sings his songs, and that he writes each one. What also made me like him more is that he’s Christian, which is great! 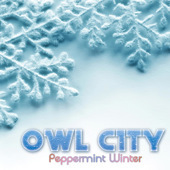 Now, this new single of his, called Peppermint Winter, as the name implies, is about Winter season. This isn’t his first song about Winter/Christmas season though. He has another one, namely The Christmas Song. But the difference is that The Christmas Song Focuses more on, well, Christmas. Peppermint Seems to focus more on the experience of Winter, which I like, because I live in a tropical country, which means there’s no snow here. But this song, when I listen to it with eyes closed, and with my hyperactive imagination, I could actually experience it all in my head. Now, a small percent of my brain tells me that I like it because of the title. Ever since I had my first taste of peppermint when I was 10, I was obsessed with it. For some reason, I love it more than any thing else minty. Up to now, I still exhibit my weird love for peppermint here in our country. Every Christmas, Dairy Queen and Starbucks put up their seasonal products, Dark Peppermint and Peppermint Mocha, respectively. And whenever I can, I treat myself to either one. My friends and family give me strange looks whenever I eat, because they find the taste of peppermint to remind them of toothpaste too much. Oh, well. I wasn’t really normal from the start. Haha! I’m really happy with how things have turned out today. It’s a Friday, so that’s natural. But I had expected it to be somewhat gloomy, because it’s cleanup day..again. Every one and a while ,the school announces a cleanup day, in which the students will have to clean the classroom, and the landscape outside on the corridor. We were all like, “Aww man!”, “Again?” and most of all, the reaction of us girls: “We don’t get to wear pants!? That’s sick.” Because, we only get to wear pants on Wednesdays, and the rest of the week, long, itchy skirts. The started out pretty slow, with me using a broom to clean up the floor, then pulled out my scissors to cut away the dead leaves and stems off the plants in our landscape. While I was doing it, one of the boys moved away the pot in the middle, and we were all surprised to find that a medium-sized lizard was inside it. Our adviser made a joke and told us, “Go catch it! Catch it for Biology class!” We all laughed, but we did it anyways for the next ocuple of minutes. I almost caught it, someone just bumped me and I missed the lizard. Oh well. Most of the day was very normal, other than lunchtime and music class. At lunchtime, I didn’t feel like eating, as usual. So rather than sitting like an idiot for about 40 minutes like I usually do, I headed for the library. And I also picked up my Biology book, and my intermediate pad, to finish the concept map that was supposedly an assignment. So once I got there, I noticed that half the lights were turned off, which was weird. But that didn’t stop me. For about 15 minutes, I worked on my paper, until I finished. That’s where the funny part comes in. Our Audio-Visual Technician comes in, and tells us that the library is close for the day, because it’s reserved for the puppet show rehearsal. He even asked all of us inside the room if we saw the notice on the door, which we didn’t. I considered this funny because I’m usually attentive to stuff like that. Yeah. Later in the day, everybody was acting as if they were high on drugs or something, which I couldn’t blame ourselves for, because it’s finally Friday, and there’s only one subject left before dismissal. Music. Today, we discussed about some of the different Korean Instruments. We spent music class laughing at almost anything, each other, each others laughs, even the names of the Korean instruments. Yes, when we fee like it, we can laugh at anything. But that’s only the icing on the cake. The real cake happened before that. During recess, I went upstairs to the faculty, for no apparent reason other than randomly picking out one of my classmates and following them around. When they went to the faculty, my computer class teacher saw me, and she was like, “Winonaaaaa!”, which startled me. As I was startled, she took me by the hand and dragged me to the computer lab, and all the while she was smiling. I asked her what’s up, and she wouldn’t tell me. When we got me to the lab, she told me to look at the screen. At first, all I could see was a .pdf file with a table of names on it. Then my teacher pointed to a table titled “High School: AVP using Adobe Flash”. In that table, the first three rows were highlighted in yellow. I recognized then as the winners in the recent ICT: Battle of the Wizards competition I entered in. Then as my eyes scrolled down, I saw my name in the table! I was ranked as #6, tied with another student. But I couldn’t care less, out of, I don’t know, 20 or 30 schools in our region, I was one of the top 10! I was overjoyed! Well, that’s most of what happened today, and as an ending note, here’s a song from Paramore’s album, Brand New Eyes entitled “Looking Up”. I could sing it happily today without caring who hears me. I came to realize one of the strange truths in my life just now. I realized how hard it is for me to actually say that I am really truly happy. I could probably pinpoint some of the reasons why. Okay, this I found out through serendipity. I was listening to another one of my playlists, which featured Evanescence, Elliot Minor and Mozart’s Requiem. It just so happened my computer likes to arrange everything in alphabetical order, so when I listened to my playlist, Mozart’s Lacrimosa and Evanescence’s Lacrymosa came together. So after Mozart’s Lacrimosa ended, and the other one started playing, I wondered if I made a mistake and put two copies of one song in the playlist. So I checked the folder, and realized that they were actually different. So I powered up my trusty Virtual DJ, which was a basic program used for remixing up to two songs. Or, in this case, you can use it to play two songs simultaneously. So I loaded both of the songs onto the deck and played ’em. There I discovered that the two songs didn’t vary too much from each other. So I decided to turn to trusty Google for more answers. Being directed to Wikipedia, there I found that Evanescence’s version was based on Mozart’s original, and the only difference is that Mozart’s was played in D Minor, and the Evanescence version played E Minor. Well, this doesn’t mean I’m officially off hiatus now, but I just decided to post. I’m pretty sure I’m not the only one who has different kinds of playlists for whenever she feels like playing different songs.